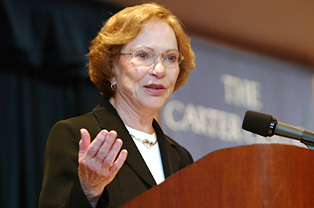 ATLANTA…The Carter Center Mental Health Program has partnered with the Al Jalila Foundation to develop and implement a United Arab Emirates (UAE) Rosalynn Carter Fellowships for Mental Health Journalism (RCJF). This program will be the first mental health fellowship program for journalists in the Middle East. The announcement of this mental health program was made today at a signing ceremony at the Mohammed Bin Rashid Academic Medical Center at Dubai Healthcare City. The signing was attended by Her Excellency Dr. Raja Easa Al Gurg, member of the Board for Trustees and chairperson of the Board of Directors, Al Jalila Foundation; Dr. Abdulkareem Sultan Al Olama, chief executive officer of Al Jalila Foundation; Jason Carter, chairman of the Carter Center’s Board of Trustees, and a number of leading healthcare and media representatives. Over nearly two decades, the Center has awarded one-year fellowships to 165 journalists to connect them with resources and experts to increase the quality and accuracy of mental health reporting around the world. The program is currently in the United States and Colombia and was previously in New Zealand, South Africa, and Romania. The Carter Center will provide trainings, educational materials, mentorship, evaluation tools, and technical assistance to develop a sustainable and tailored program in the UAE. The Al Jalila Foundation will manage the program in the UAE and will be responsible for the selection of journalists, facilitating media trainings, adapting the program to meet the needs of the Emirates, and local evaluations. Since the Rosalynn Carter Fellowships for Mental Health Journalism were established in 1996, fellows have produced more than 1500 stories, documentaries, books, and other works during and after their fellowship year. Their projects have garnered an Emmy, nominations for the Pulitzer Prize, and other awards.